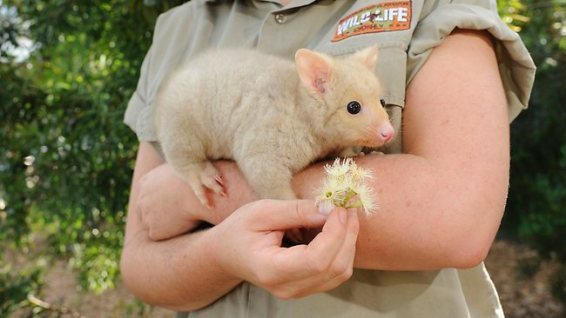 A very rare Golden Brushtailed Possum was born here in Australia at Wild Life Sydney. For those that are not familiar with possums, here in Australia we have a very common brushtail possum that is seen everywhere, they are native to Australia, and they are nocturnal, and like the koala they also like the eucalyptus leaves, as part of their diet, but their main food is fruits, seeds, flowers and shoots, they have been known to eat small animals as well. The possums are often seen in city areas, in fact they will thrive in the cities, they raid vegetable gardens, fruit trees, and on occasion will raid the kitchen. Now that you know all about the common possum, let me introduce to you Australia’s rarest possum, this little cutie is 6 months old and his name is Bailey. The six-month old possum was introduced to the public today. 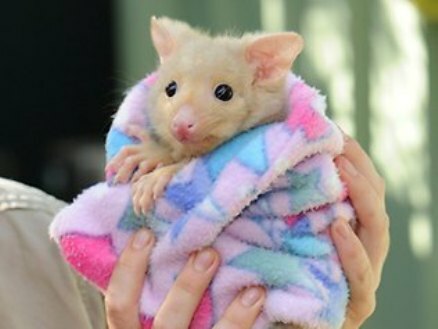 Bailey is a Golden Brushtail Possum, and Bailey’s parents arrived at Wild Life Sydney about 4 years ago and have given birth to 3 possums. If you ever see one in the wild count yourself very lucky, they are very rare indeed in the wild. This entry was posted in Animals, Australia and tagged Common Brushtail Possum, Golden Brushtail Possum, Possum, Wild Life Sydney. Bookmark the permalink. 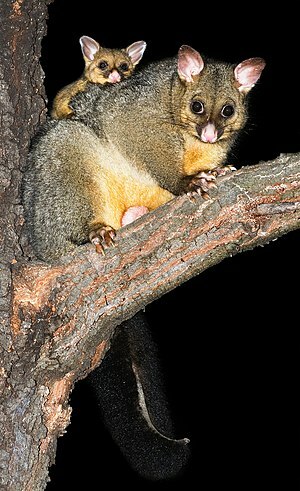 I found a Golden brush tailed possum yesturday it was curled up next to my front door. Never have i seen anything this cute in my life. I rand Victorian wildlife and they sent out a wonderful person to take it to the vets. All good they dropped it back last night and now lives in the trees behind us. Thank You very much for sharing your story with me and other readers, and Thank You very much for taking the time to comment and visiting my blog. OMG, this thing is cute. I want to have one as a pet! It’s illegal to keep native animals in Australia as pets. Possums, however, are well known for adopting humans. I had one take up residence in my roof when I lived in the Melbourne suburb of Wattle Park, and you wouldn’t believe how much noise it made. Imagine a wrestler clomping around over your head in hobnailed boots at 3am… and if your new tenant brings a friend along, why, you can listen to them fighting! Bailey is a very cute little critter to be sure, but he’d soon wear out his welcome. I have a few geckos living in my house and they’re much better behaved. Fabulous post – great pictures. Oh my goodness! Little Bailey is precious! I’m glad that she’ll be protected with her family. We have possums here but they aren’t anywhere near as cute. In fact they’re pretty ugly, gray with long tails. They sort of look like giant rats. But I suppose they’re good natured for the most part. They come out at night and get into everyone’s gardens and garbage. They’re not as pesky as the Raccoons, though. This is so GREAT! Thank you!!! I think they give new meaning to the word ugly! Hahaha! Naw, she’s cute! Oh my gosh, Bailey looks ADORABLE! I have nominated you for the Hope Unites Globally (HUG) Award. If you choose to accept this award, here are the guidelines: http://ahopefortoday.com/2012/01/14/hope-unites-globally-hug-award-guidelines/ Thank you for making the world a better place with your writing and view of the world you share it with all. Ooohhh… little Bailey — I just want to hug him! Oh yes the standard native possums here can make a mess if you have a veggie garden or fruit trees around. Very precious and cute indeed :-). I never thought I’d see the day that I thought a possum was cute. As other bloggers answered, here they look like rats with long tails. Bailey is a cutie, but so are most baby anythings. An animal that ruins my gardens is no friend of mine, cute or not! Your possums are so much cuter than the ones we have here in the States. Ours are plain grey and white with sharp pointy noses. But even their babies are adorable. Interesting creatures to be sure. Thanks to you I now want to adopt the possums in our roof instead of eradicating them – hehe! (That is if they are possums). I’d never heard of the golden variety! There are people that do have them as sort of pets, they are free to come and go but they put different fruits out for them. When they are not in the roof, they like to live in hollowed out logs, which some people put up in the tree with a bit of fruit. I’ve never seen one in the wild but even seeing one in a photo is just as good. I can’t believe the colours. How gorgeous. I know what you mean about possums in the roof. I’ve had many experiences with that. We had common brushtail stuck in our chimney once. It got wedged there. The wailing was terrifying. At first we didn’t know what it was. My son who was about five at the time thought it was a ghost. We had to take most of the chimney apart to get it out. Cute! I did see possums when I was in Melbourne. There were hanging out in a park near our hotel. Precious! In the picture where that woman is holding him, the little golden guy looks as docile as a cat. 🙂 I checked out Wild Life Sydney — looks amazing! If we were ever in Australia, I know my family would love that place. Congrats on showing me my first-ever non-Northern American Possum … the little one is a cutie. Is it me, or do the heads look a bit small for the bodies? What a cute little adorable possum! You always find the most interesting news and stories Mags! 🙂 I learn new things from you! Thank you! utterly adorable! We once had a polecat move into our attic – equally lovely creature but very noisy! Great blog post. Made me smile. Wonderful photos and writing, Mags. There are so many amazing animals in the world, and always more to learn about. Thank you. Possums and koalas – such exotic creatures to us here in Canada! They are a gorgeous animal, such beautiful colouring, it is a shame these golden possums are so rare. I’d never heard of a golden possum before. I had an encounter with a tame ring-tailed possum when I was a child. My great-uncle’s housekeeper’s daughter had raised one because its mother had died in a trap and the baby was still clinging to her. He was called Peter because he loved Peter’s Ice-Cream. My father was in his Super-8 phase of Visual Arts at the time so of course had to film it. We had film of it eating a banana in the daughter’s hair, then he wanted me to take it. So we put a thick towel folded many times onto my arm and the possum used it like a tree branch. You could push him off and he would hang by his tail, then climb up his tail and back onto the towel. However, those claws went through all the layers of towel and I could be seen silently (there was no sound) “ow”-ing and “ouch”-ing through the whole thing. Very funny now but not at the time. Absolutely adorable!!! Much cuter than the gray possums we have here. I want one!! Look at those beady eyes! A gorgeous little fellow. So happy I could watch! They are not as rear as you think and can survive in the wild. Yes another person that commented also said there was one living in a tree at the back of their place, I think it’s great that there are obviously a few around, they are a beautiful animal. Thank You very much for visiting and taking the time to comment. For those looking for jokes, just click onto the Category drop down menu below and click onto Jokes. WordPress.com is a free blogging site, to keep the blogging site free, WordPress.com show Google ads on my blog. I have no control over this nor do I earn anything from it, other than being able to blog for free. © Magsx2 Blog, 2012. Unauthorized use and/or duplication of this material from this blog’s author and/or owner is strictly prohibited. Excerpts and links may be used, provided that full and clear credit is given to Magsx2 Blog with appropriate and specific direction to the original content.